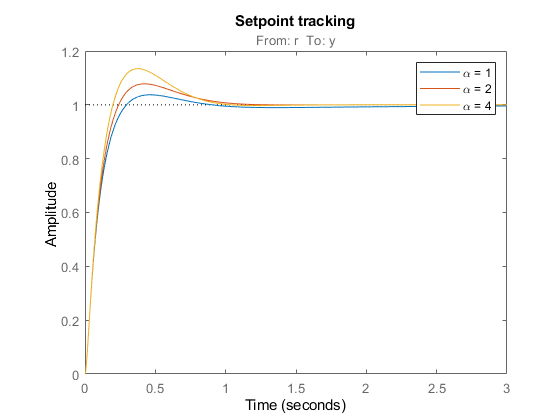 This example uses systune to explore trade-offs between setpoint tracking and disturbance rejection when tuning PID controllers. When tuning 1-DOF PID controllers, it is often impossible to achieve good tracking and fast disturbance rejection at the same time. 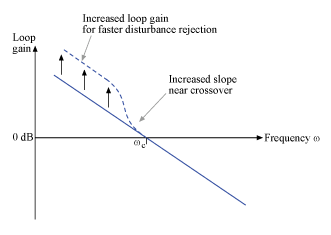 Assuming the control bandwidth is fixed, faster disturbance rejection requires more gain inside the bandwidth, which can only be achieved by increasing the slope near the crossover frequency. Because a larger slope means a smaller phase margin, this typically comes at the expense of more overshoot in the response to setpoint changes. Figure 1: Trade-off in 1-DOF PID Tuning. This example uses systune to explore this trade-off and find the right compromise for your application. See also pidtool for a more direct way to make such trade-off (see "Design Focus" under Controller Options). Consider the PID loop of Figure 2 with a load disturbance at the plant input. Figure 2: PID Control Loop. The target control bandwidth is 10 rad/s. Create a tunable PID controller and fix its derivative filter time constant to (10 times the bandwidth) so that there are only three gains to tune (proportional, integral, and derivative gains). Construct a tunable model T0 of the closed-loop transfer from r to y. Use an "analysis point" block to mark the location u where the disturbance enters. "MinLoopGain" requirement to adjust the integral gain at frequencies below 0.1 rad/s. Use systune to tune the PID gains to meet these requirements. Treat the bandwidth and disturbance rejection goals as hard constraints and optimize tracking subject to these constraints. Verify that all three requirements are nearly met. The blue curves are the achieved values and the yellow patches highlight regions where the requirements are violated. 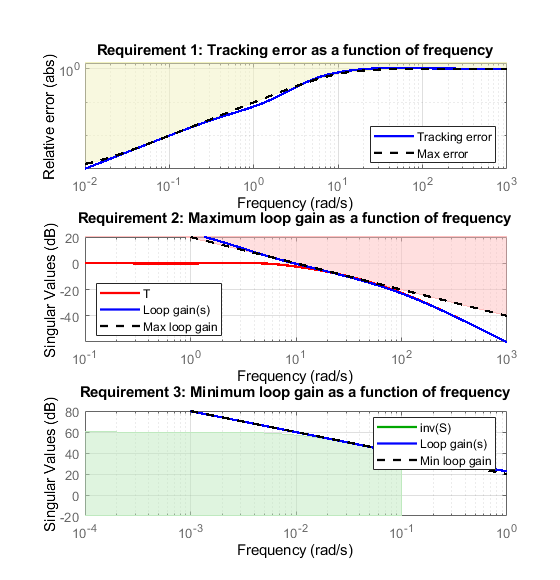 To gain insight into the trade-off between tracking and disturbance rejection, increase the minimum loop gain in the frequency band [0,0.1] rad/s by a factor . Re-tune the PID gains for the values . Compare the responses to a step command r and to a step disturbance d entering at the plant input u. 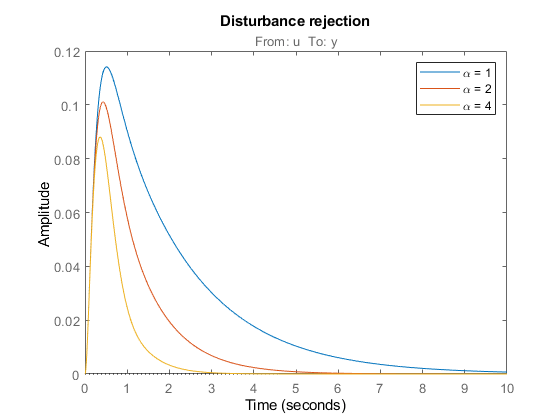 Note how disturbance rejection improves as alpha increases, but at the expense of increased overshoot in setpoint tracking. 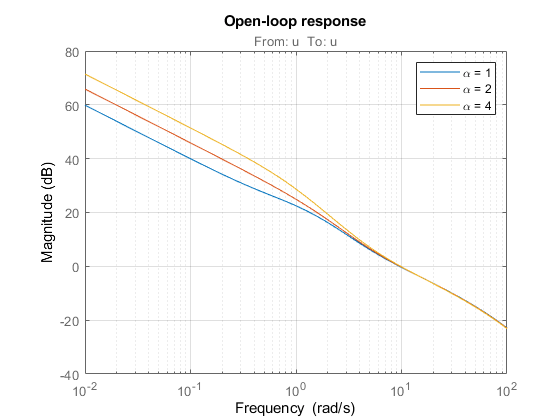 Plot the open-loop responses for the three designs, and note how the slope before crossover (0dB) increases with alpha. Which design is most suitable depends on the primary purpose of the feedback loop you are tuning. 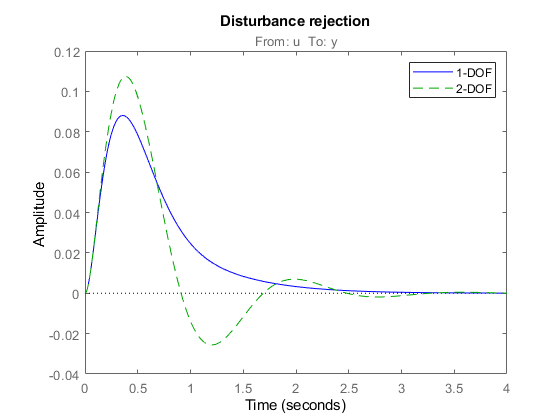 If you cannot compromise tracking to improve disturbance rejection, consider using a 2-DOF architecture instead. A 2-DOF PID controller is capable of fast disturbance rejection without significant increase of overshoot in setpoint tracking. Figure 3: 2-DOF PID Control Loop. Use the tunablePID2 object to parameterize the 2-DOF PID controller and construct a tunable model T0 of the closed-loop system in Figure 3. Next tune the 2-DOF PI controller for the largest loop gain tried earlier ( ). Compare the setpoint tracking and disturbance rejection properties of the 1-DOF and 2-DOF designs for . 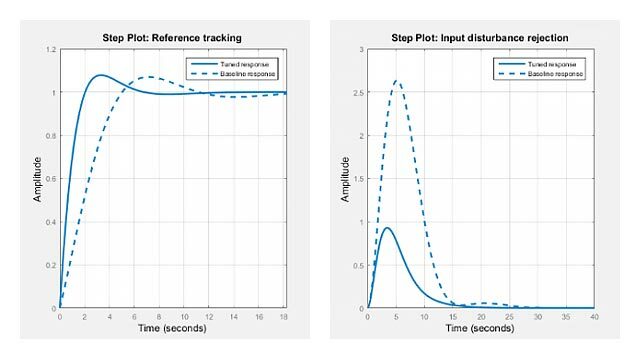 The responses to a step disturbance are similar but the 2-DOF controller eliminates the overshoot in the response to a setpoint change. You can use showTunable to compare the tuned gains in the 1-DOF and 2-DOF controllers.